Juicy cod loin portions coated in a natural oven bake breadcrumb. 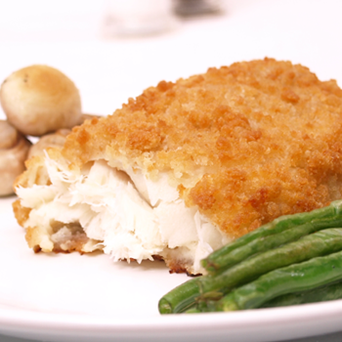 Prime fillet of boned haddock coated in a crunchy oven bake breadcrumb. Prime fillet plaice coated in a tasty lemon and pepper breadcrumb. Oven bake or Fry. Prime lemon sole fillet coated in a golden breadcrumb. Oven bake or Fry. Boned haddock fillet topped with a rich cheese, prawn and mushroom sauce, coated in a lemon and pepper breadcrumb. Oven bake or Fry. Succulent chunks of salmon fillet with florets of broccoli in a dill sauce in a golden breadcrumb. Oven bake or Grill. Beautiful pieces of haddock and ham in a rich cheese sauce encased in a golden breadcrumb. Oven bake or Grill. Prime Pollock Fillet fingers in a crispy ovenable natural breadcrumb – super jumbo size (120g)! Prime Atlantic Fillet pieces in a crispy natural breadcrumb coater. Oven or fry. Lemon sole fillet topped with a delicious white wine sauce, garnished with prawns, mushrooms and grated cheese, Oven bake from frozen. Lemon sole fillets teamed with a cheese, prawn and mushroom sauce all enrobed in a crisp, tasty lemon and pepper breadcrumb, Oven bake from frozen. Prime cuts of our best Grimsby cod in a cheese prawn and mushroom sauce encased in cradle of puff pastry, Oven bake. Prime cuts of our best Scottish Salmon in a rich butter sauce encased in cradle of puff pastry. Oven bake. Smoked Haddock in a rich florentine sauce of spinach and cheese, encased in puff pastry finished with cheddar, red currents and egg glaze. Chunks of Atlantic Salmon Fillet with slices of Apricot on a wooden skewer. Perfect for grilling or the BBQ. Chunks of Tuna fillet in a smokey BBQ marinade then with red and green pepper pieces on a wooden skewer. Perfect for grilling or the BBQ. Atlantic Salmon, Tuna, Sword and a peeled Tiger Prawn with red and green peppers on a wooden skewer. Perfect for grilling or the BBQ. Faroese Salmon tail fillets, deep skinned and boned, marinated in Scottish honey and then hot smoked over oak. Size: 125-200g. Simply defrost and serve. Large Tropical Prawns in a rich butter and herb sauce. Simply pan fry! A combination of caramalised vegetables with brie on a puff pastry tart.